The Vine-yl Blog: HOLY MINDF#%K BATMAN! We just got back from seeing Coraline in 3D (we had to have a few martinis to come down afterwards, of course.) This is a new breathtakingly beautiful stop-motion animated film from Director Henry Selick who also directed The Nightmare Before Christmas. The fact that it is being shown in 3D makes it that much more mind blowing. This is not the 3D we grew up with of course, with the flimsy red and green glasses. These are sturdy 3D glasses for the new millennium that provide an eerie reality-altering kind of experience. It's the equivalent of being a child again and seeing 3D for the first time. You truly feel like you are inside the world of the film, like you could reach out and touch it, or that it might reach out and touch you (without the use of any kind of hallucinatory drugs!) The voice acting is wonderful, with Terri Hatcher delivering an especially surprising performance. The score is hauntingly gorgeous with a nice little cameo from "They Might Be Giants." This is a must see for sure in my book, especially for any fellow animation junkies. Very freaky though, I wouldn't bring your children or you nieces or nephews to this one. I myself will probably have some nightmares later. 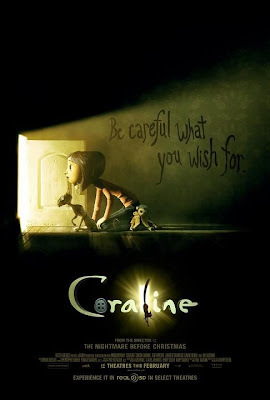 But, Coraline is truly a work of art. A film that will have you riveted to your seat watching the exquisite world Selick has created come to life before your eyes. Well done indeed.